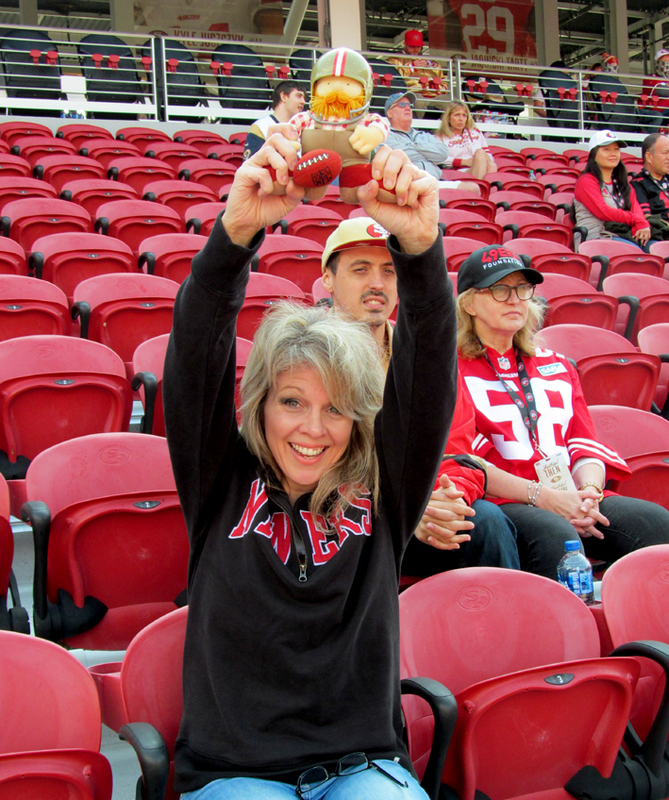 As part of our series in celebrating female NFL fans across the UK, I’d like to introduce you to Tracey Gwynne a San Francisco 49ers fan. Tracey shares with us how she got in to the NFL, how she made the choice of her team as well as more about her overall experience as a fan. My first memory of American Football and the NFL was in the mid 1980’s. We were listening to rap at school, and I kept seeing the logo of the Los Angeles (now Oakland) Raiders on the T-Shirts and caps of the groups but didn’t take much notice. One weekend, I remember sitting up watching the Sunday night late ‘teen’ movie, ‘Pretty In Pink’. Still not tired, I left the TV on, and it led me straight into 1989’s Superbowl XXIII – San Francisco 49ers against the Cincinnati Bengals. I was transfixed by Montana, Rice etc and the sheer excitement and camaraderie of the team’s performance. I watched until the end, to see Joe Montana’s winning pass to John Taylor, with just 34 seconds left in the game. My school years were rough for me, and I was getting heavily bullied, becoming quite introverted and shy. Throughout the next few years, my love of my team and the sport in general, gave me a passion to focus on, not to mention some confidence and an imagined ‘toughness’ to get through school. Joe Montana was an inspiration to me, my hero. A great player, a respected team mate and general cool guy. I knew from then I would be a lifelong fan of the 49ers. The day I left school to collect my school exam results, I put on my game top, socks stuffed in the shoulders and full-on black under eye make up. Yes I know, a bit weird, but it was significant to me, as that meant that an unpleasant chapter was finally over. I was lucky enough to get a ticket for the 1991 Season game of the London Monarchs vs Montreal Machine. Although it wasn’t ‘my team’, just to be part of a crowd of like minded fans, I felt at home. How I wish I hadn’t thrown away my merchandise and GameTime programme for that match! 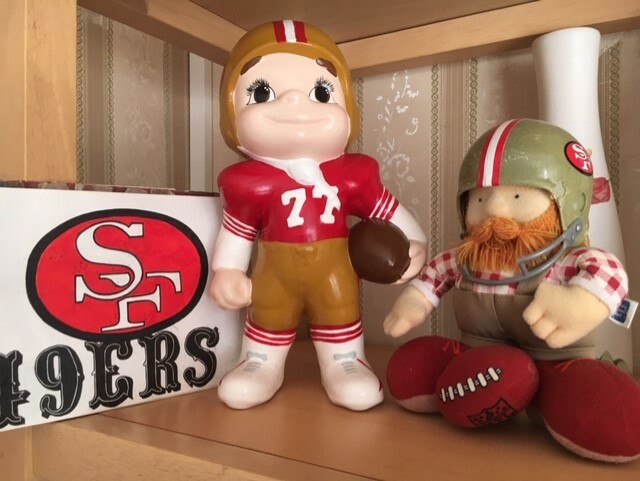 Throughout the years, I have always loved watching the sport where possible, and although dipping in and out of the game, due to life’s ups and downs, I have never wavered from supporting the 49ers. Even when the team were not doing so great (and there has been plenty of that! ), I have always been there, though it has not dampened my appreciation for ‘other teams’. We’re allowed a ‘second team’, right? And mine is the Pittsburgh Steelers. Like the Niners, they have an ‘old school’ vibe, with a great history, grit, determination, and certainly not boring to watch. A few years ago I went to Los Angeles for the first time, and although it wasn’t my team, I was happy to go to watch a home game of the L.A. Rams vs Buffalo Bills. The atmosphere in the stadium was electric, and I couldn’t get over the fact that mixed fans were all sitting together with no grief (well, maybe a bit of friendly banter…) but nothing like what you would get in English football. That’s another reason why I love the game – the family atmosphere, the entertainment, the food (and beer) and the fact that it’s a whole day out, right down to watching the highlights on Sunday night TV – I love it all! On the same holiday, I went a bit ‘left field’ and experienced an AFL indoor arena game – watching LA KISS (being a big KISS and rock music fan too). Obviously very different, but still a spectacle (and LA KISS kindly won for me, after a massive losing streak!). Sadly, not so well supported, but still a fantastic day, where I met loads of fellow fans and had a great time (they had the most rock and roll cheerleaders going!). Fast forward to my most recent holiday on October 2018 – a ‘dream come true’ visit to the home of my team. Apart from it being a great holiday (featuring a random meeting and signing with Bubba Paris in a sports store – how lucky was that? ), I finally to a 49ers home game at Levi’s Stadium in Santa Clara. 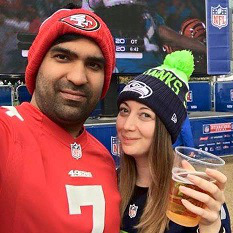 From staying in a hotel full of fans decked out in red and gold, to the pre-game freebies (branded beer bottles, posters, T shirts, and a free ’49ers kitchen apron! ), it was an awesome experience. When they officially opened the gates, and I walked through among the home crowd, I’m not ashamed to say I shed a tear. It only took me 32 years to get there! It was a lucky turn of events, which I didn’t know when booking the tickets in the UK in April, that it would be a special game. 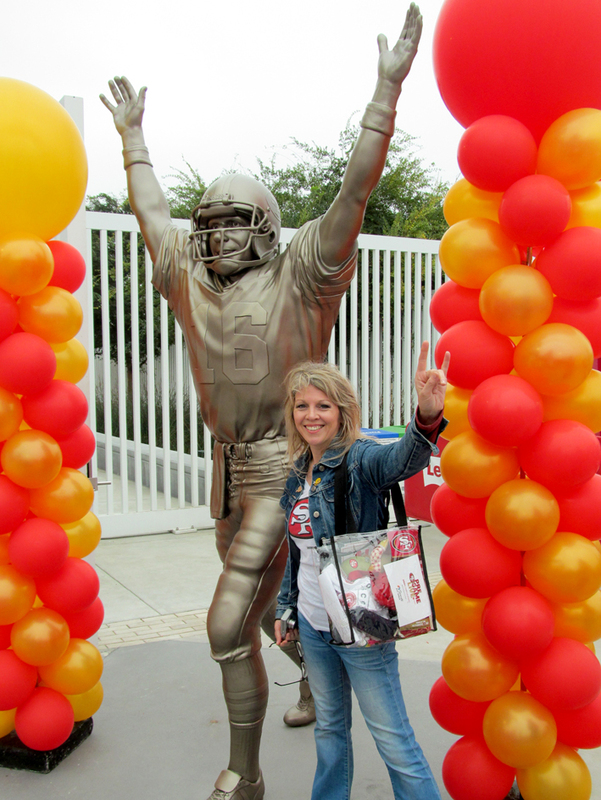 The statue of the the famous ‘Catch’ was being unveiled – the legendary moment of Joe Montana’s 23 Yard pass to Dwight Clarke, with those statues being placed exactly that distance apart. If being one of the first people to see that statue wasn’t enough, to commemorate the event, a hall of fame of the teams greatest players appeared at half time for a reunion on the pitch. And only a few feet away, stood my hero, Mr Joe Montana. It was a moment I will never forget – it clearly was meant to be (and the tears came again!). My original vintage 80’s ‘Sourdough Sam’ mascot came with me to that match, brought for my 13th birthday. And to lovely Canadian family that sat next to me in the stadium and offered to buy him, no he was not for sale, he’s a keeper! 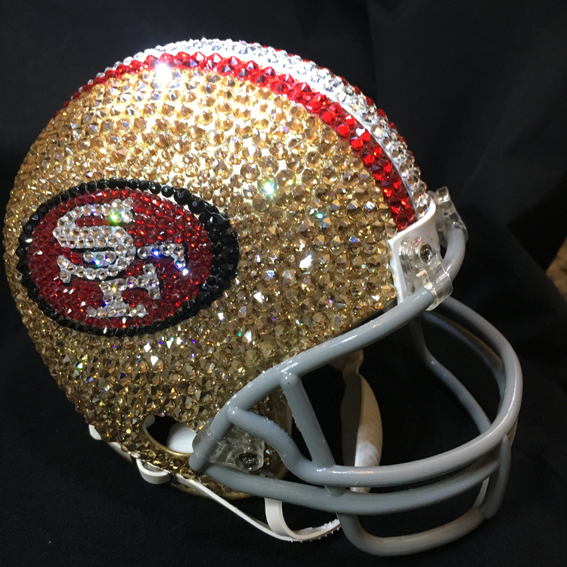 That’s my story – San Francisco 49ers for life!